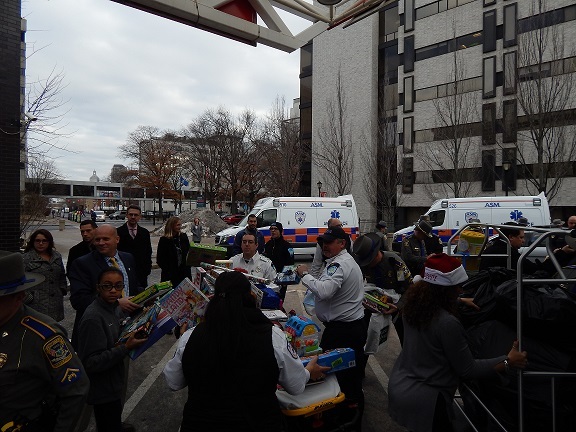 The 2016 Toy Drive was again a great success. 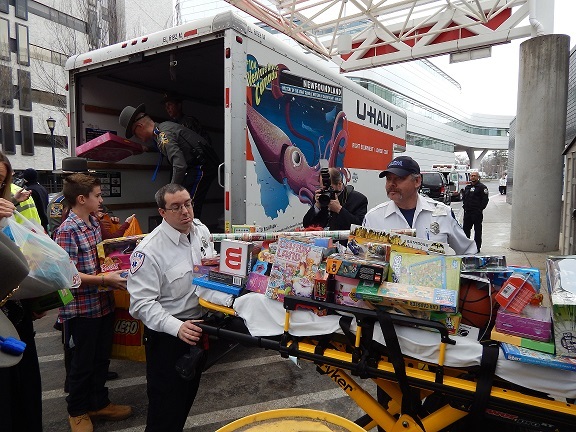 Below you will find a collage of pictures from the days spent collecting toys for Connecticut Children’s Medical Center. 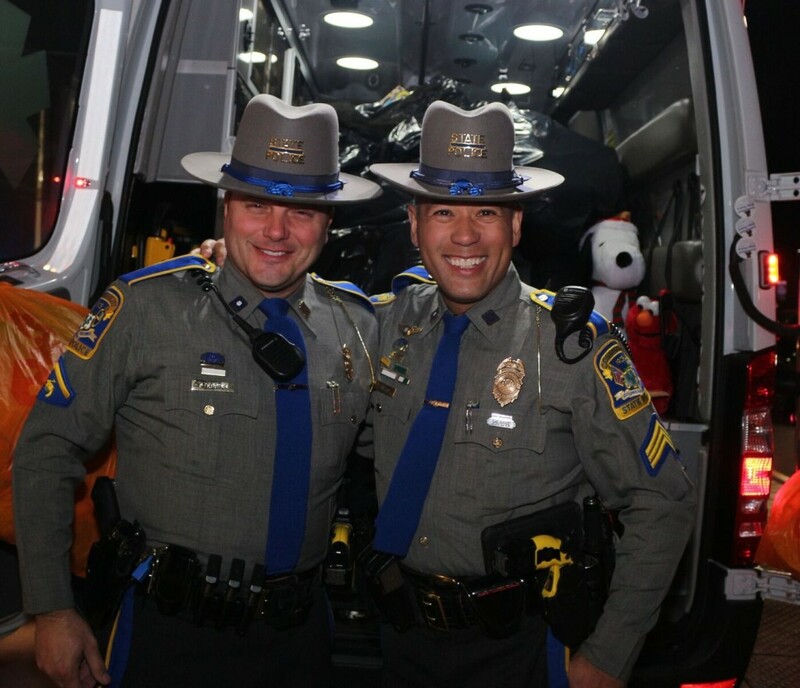 The look of pure joy on a child’s face melts the hearts of veteran troopers. 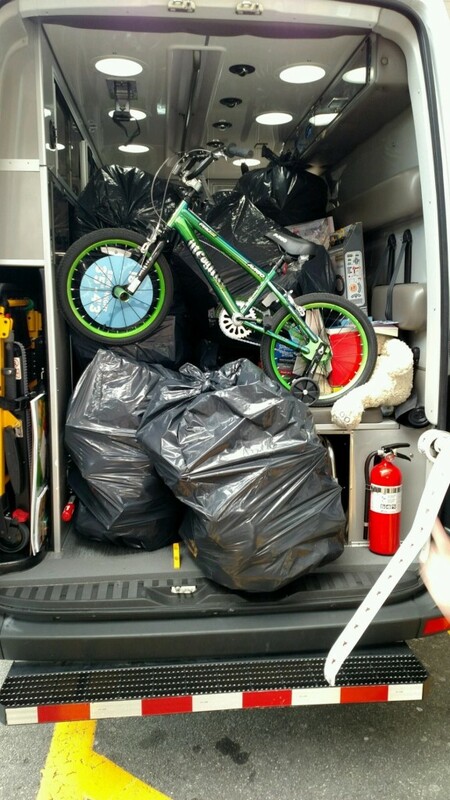 “This is a good day. 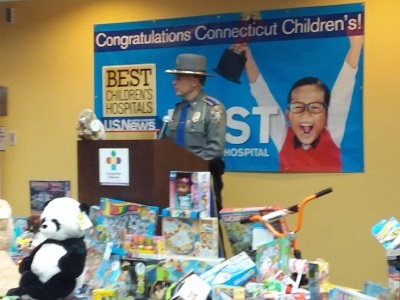 We wish every day could be Christmas,” said Lt. Col. Butch Hyatt of the Connecticut State Police. 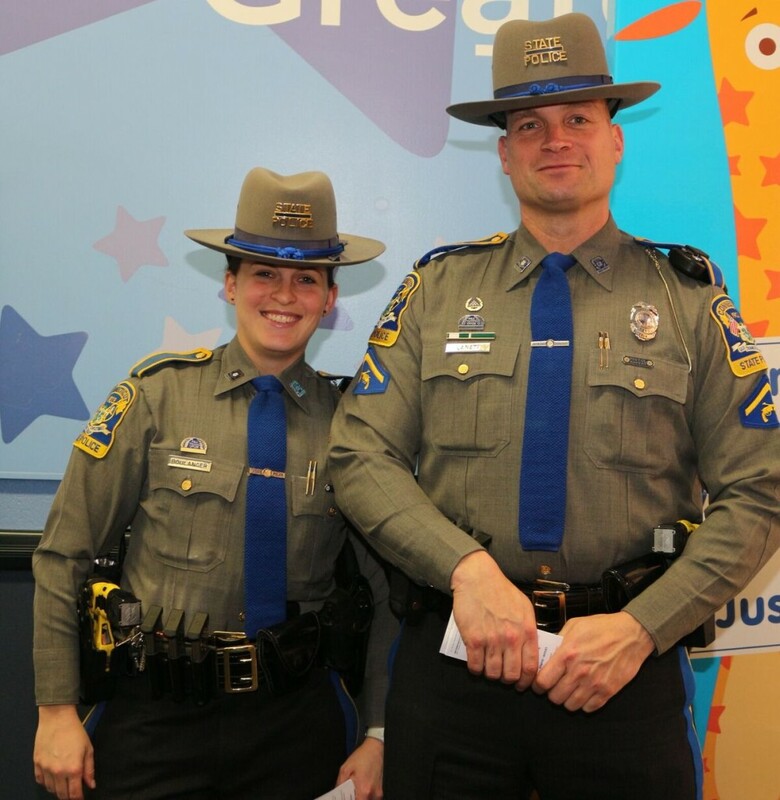 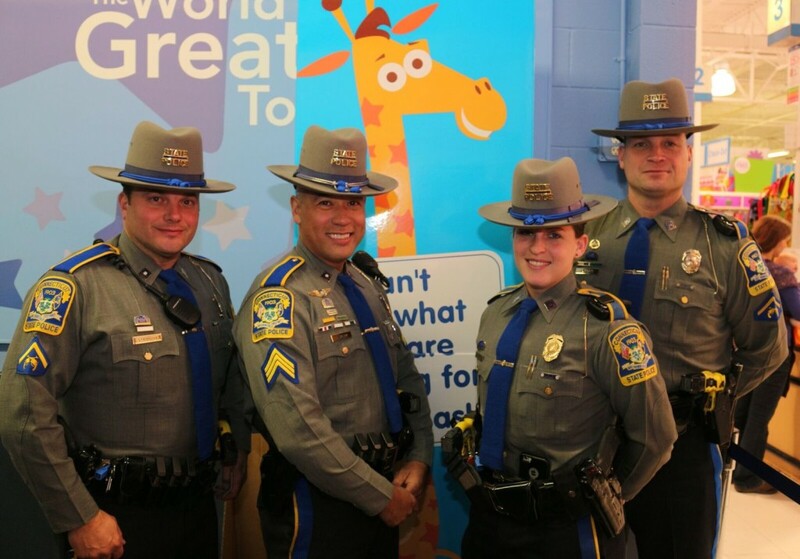 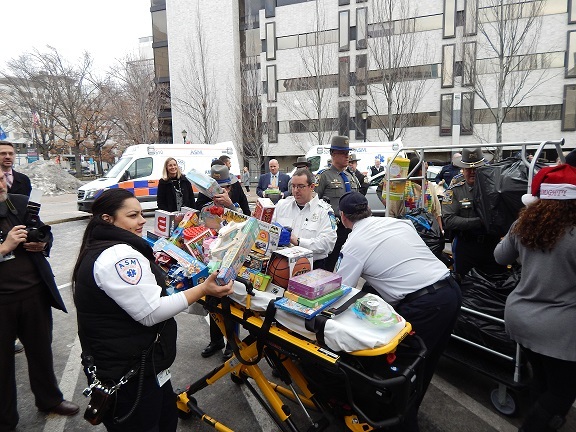 State troopers went door-to-door at Connecticut Children’s Medical Center in Hartford on Monday, handing out toys to children in the hospital’s emergency department. 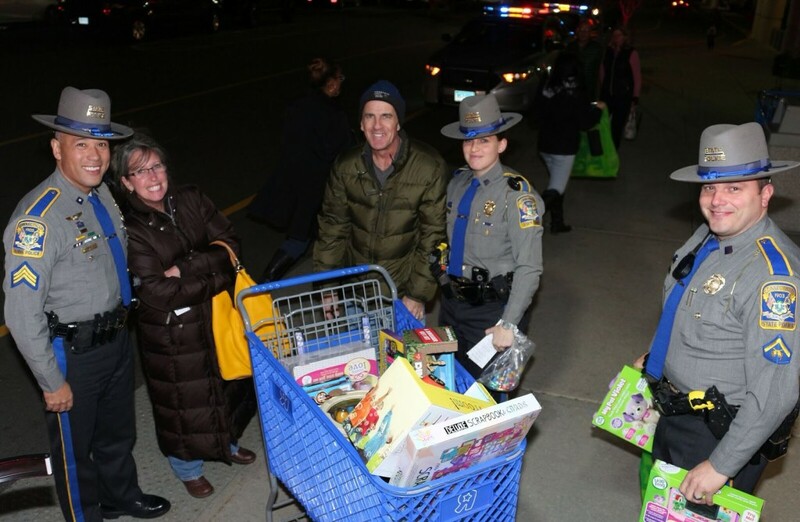 From Barbie dolls to blocks, the wish lists were covered, and troopers raised more than $20,000 thanks to the generosity of people around the state. 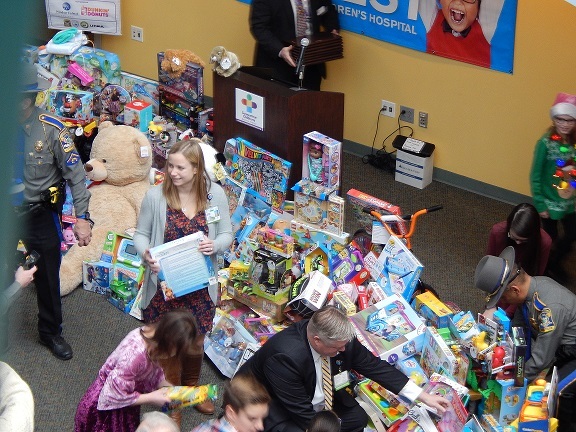 “Every toy you see, and all the dollars in the check, come from the public from their hearts, so these children can have a good Christmas,” said Hyatt. 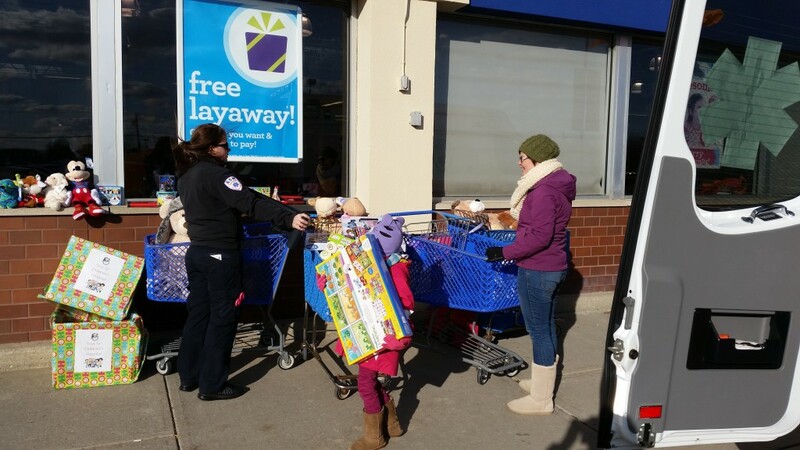 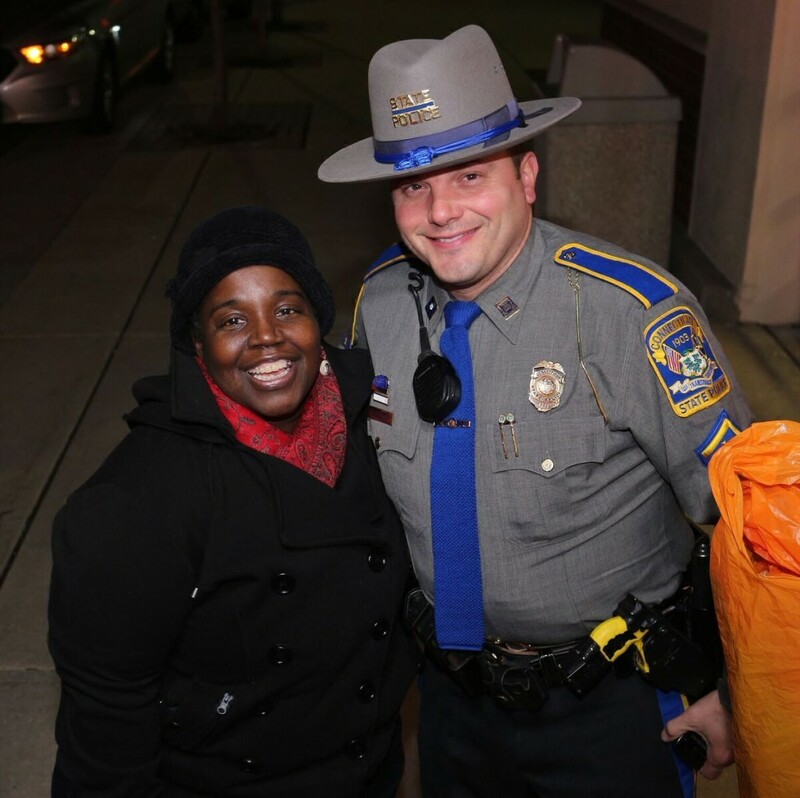 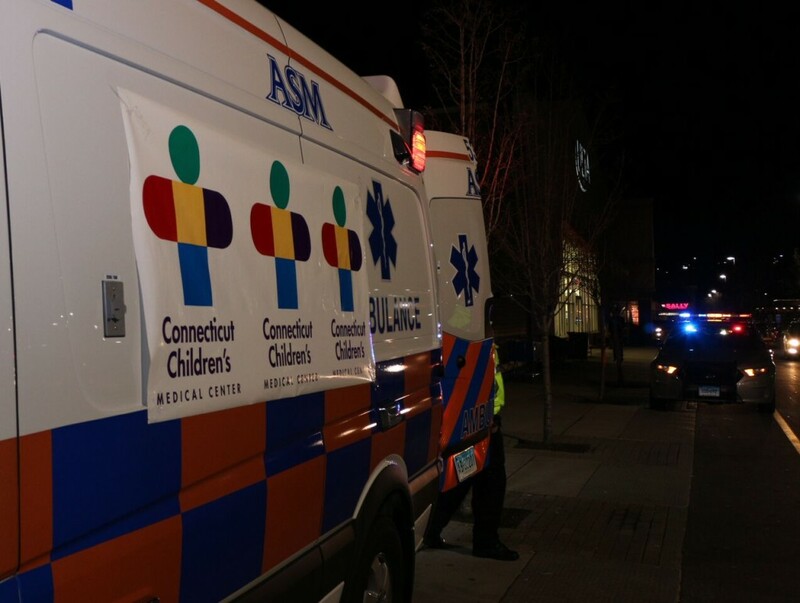 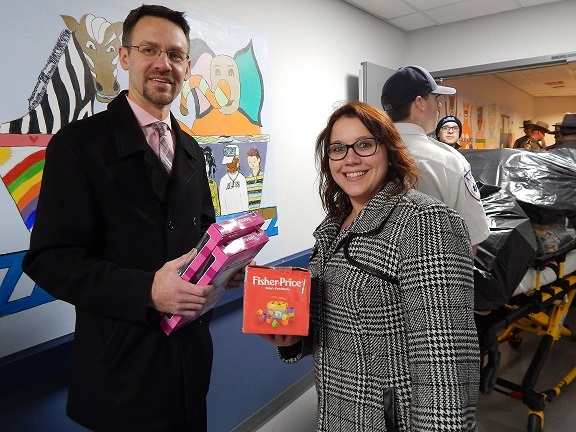 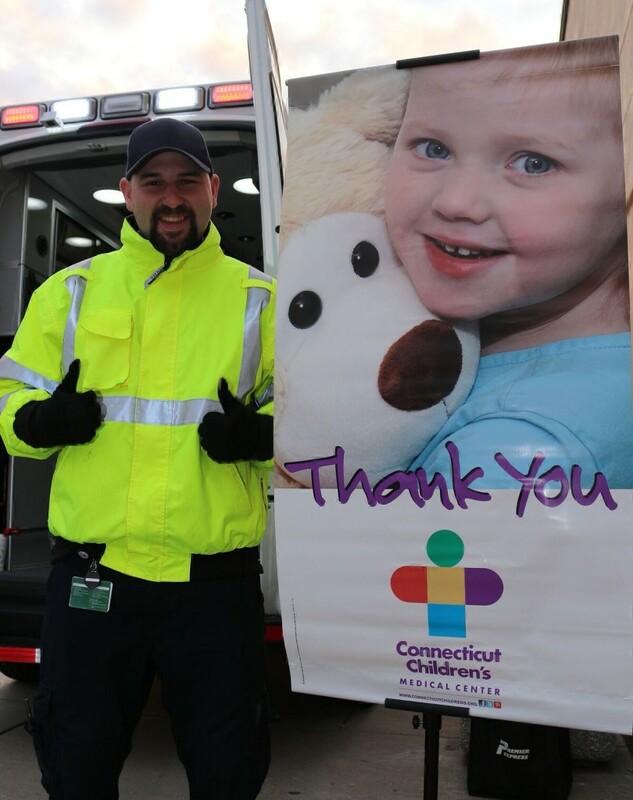 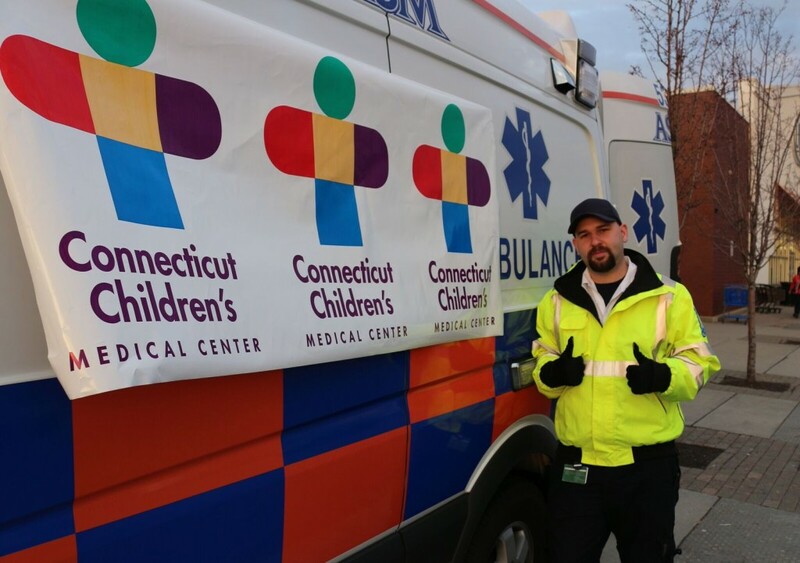 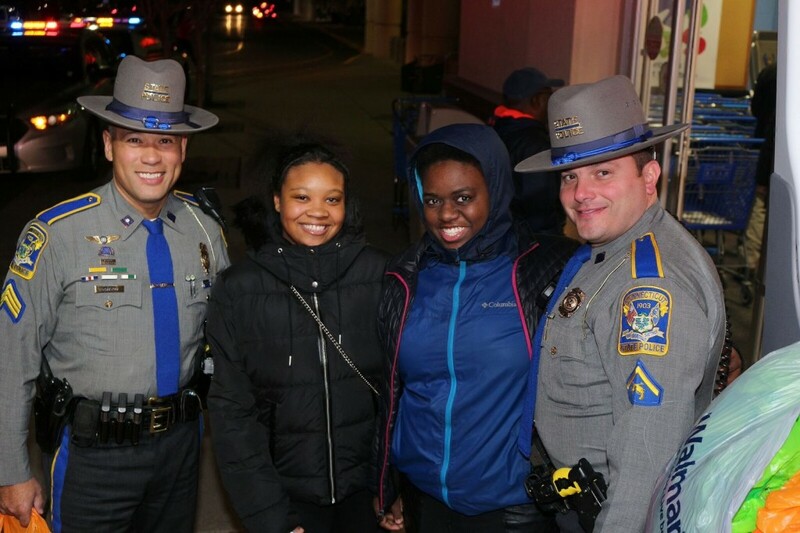 HARTFORD — On December 22, 2014 a dozen Connecticut State Police cruisers, ambulances from Aetna and ASM and a UHaul full of donated toys convoyed from Troop H to Connecticut Childcare’s Medical Center. 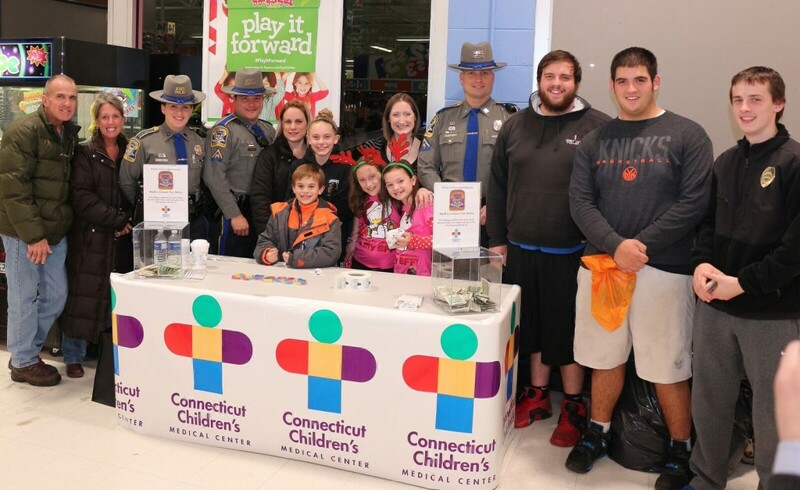 Over the course of the last four days, team of Troopers and members of the Aetna and ASM families joined together for the 18th annual effort. 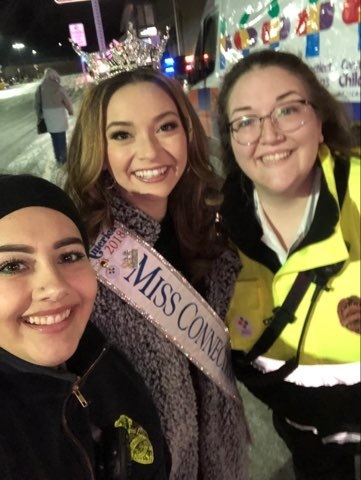 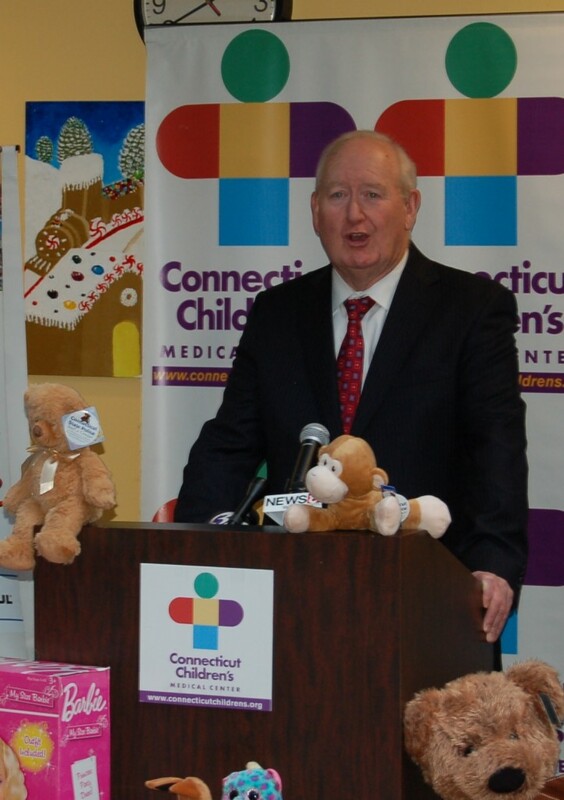 According to Connecticut Children’s President Marty Gavin, thus far the Toy Drive has brought in $220,000 and a half million toys. 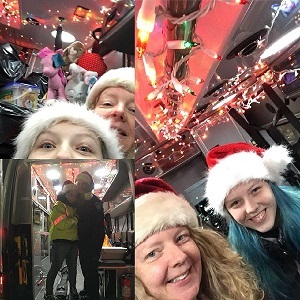 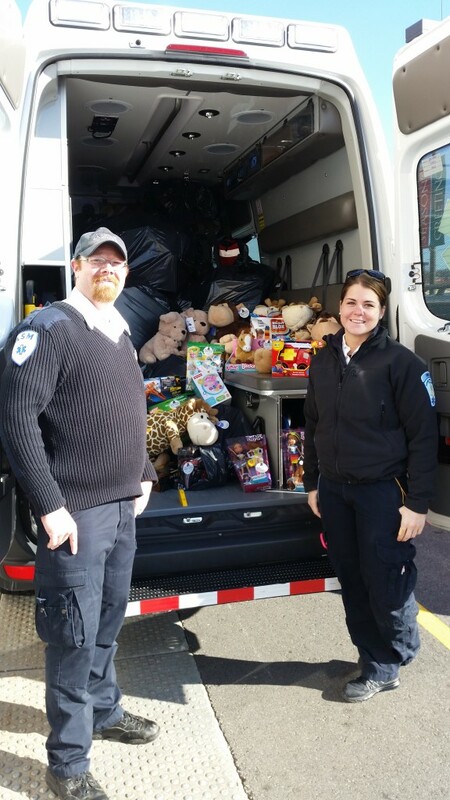 Last year alone $18,000 and three UHaul trucks full of toys were donated. 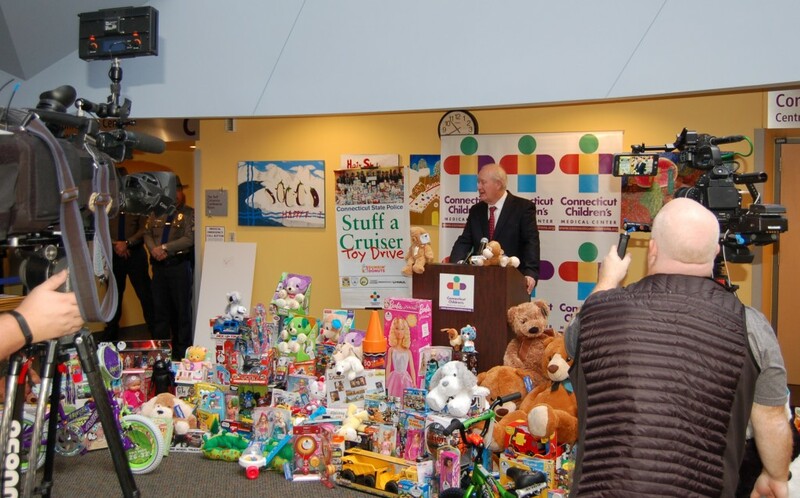 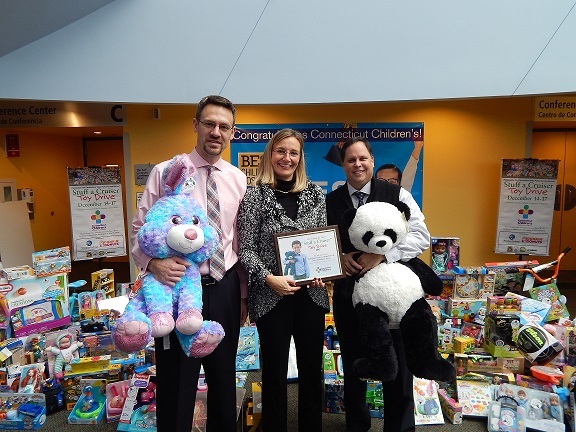 Each year enough toys are brought in to give a toy to each of the 59,000 children seen at all of CCMC’s locations. 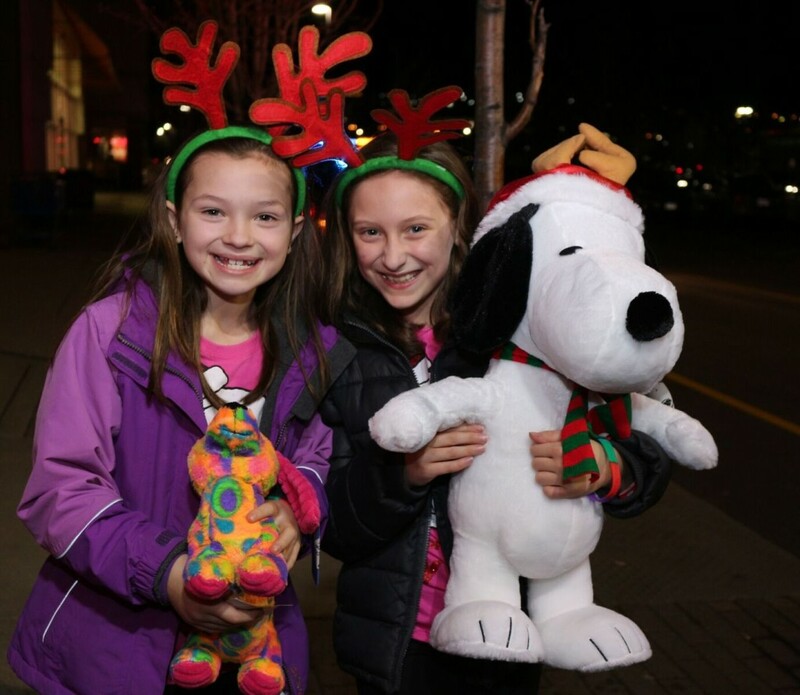 Enough even to give a toy to any siblings that accompany the child on their visit. 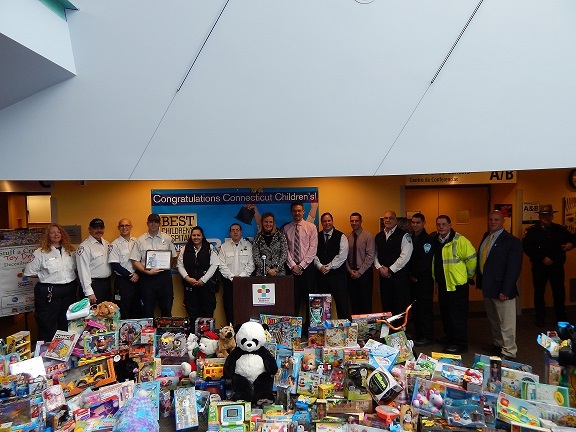 This year, Aetna and ASM contributed 216 hours to the effort. 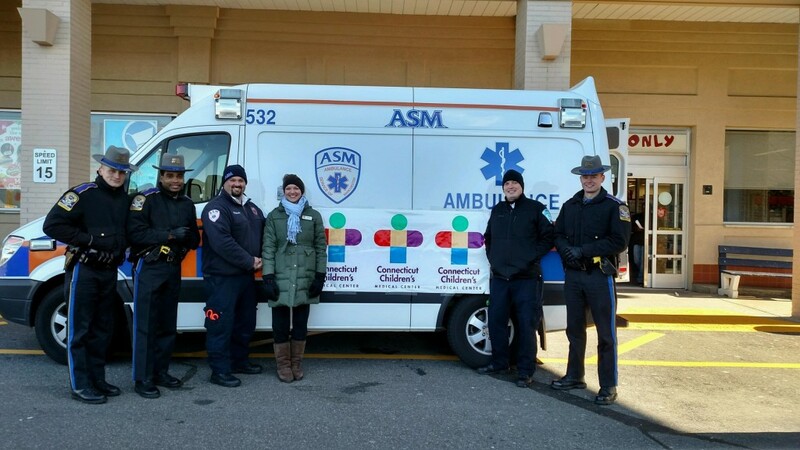 We are extraordinarily proud to take part and to be team members with CCMC and the State Police. 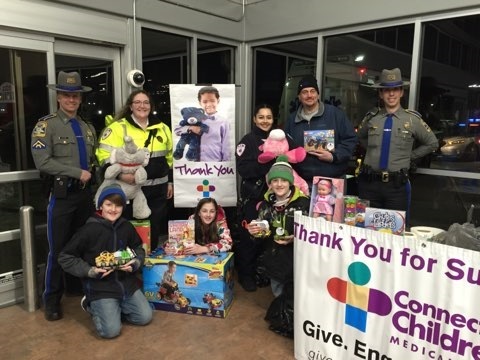 WEST HARTFORD — Attached are pictures from the Connecticut State Police ‘Stuff a Cruiser’ Toy Drive for 2013 which is a team effort with Aetna Ambulance and the Ambulance Service of Manchester. 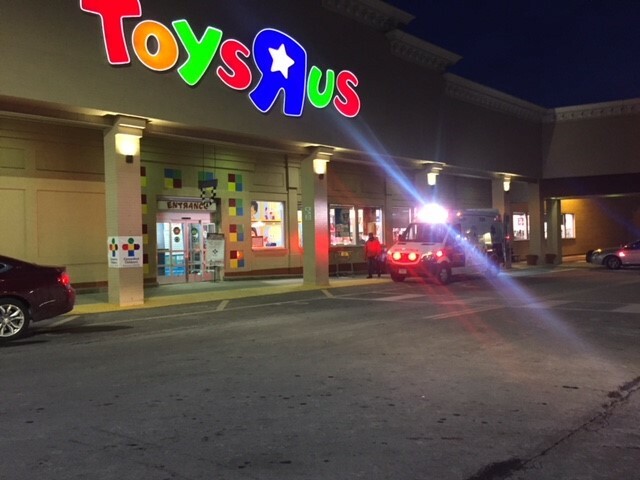 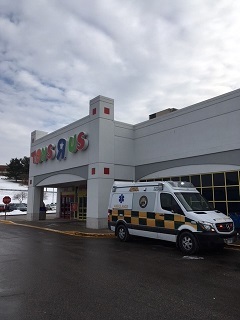 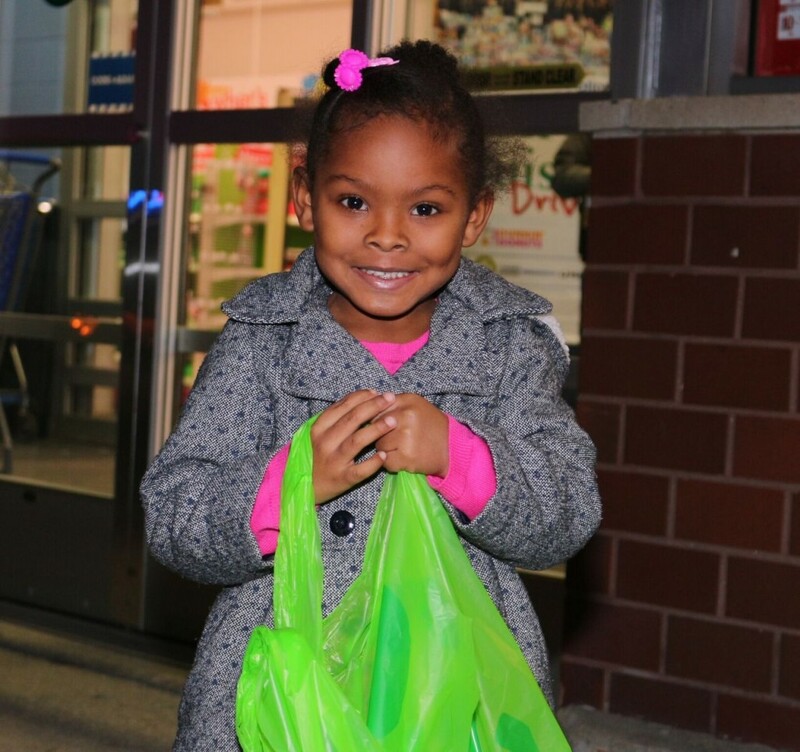 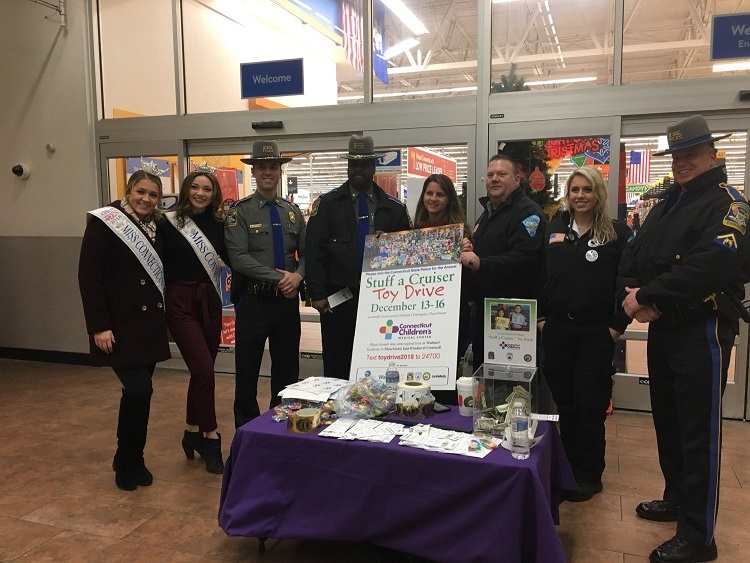 The Toy Drive took place December 19-22 at Toys R Us locations in Manchester, Newington and West Hartford and brings in cash donations and toys for children treated at Connecticut Children’s Medical Center locations throughout the year. 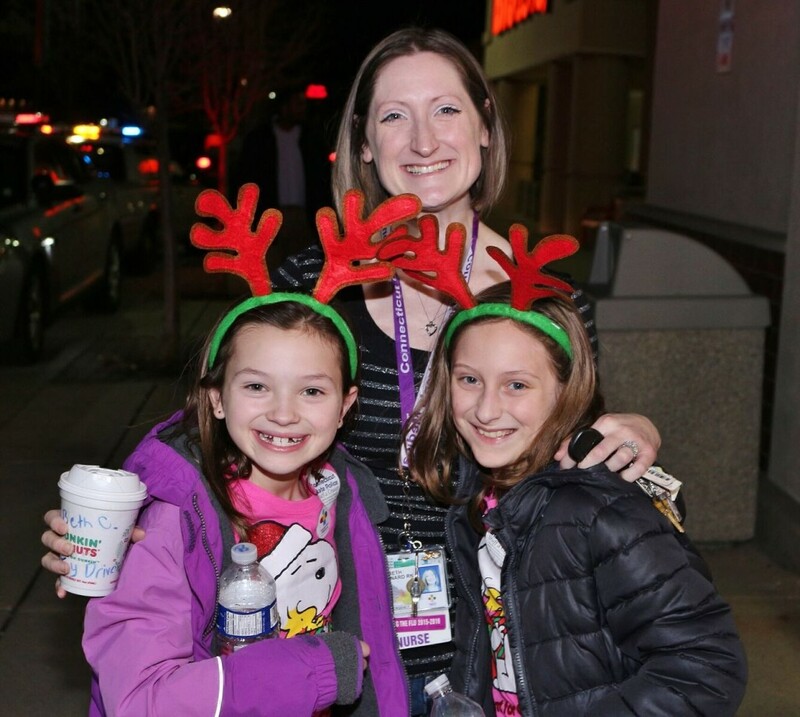 Photo credit to David Tedeschi. 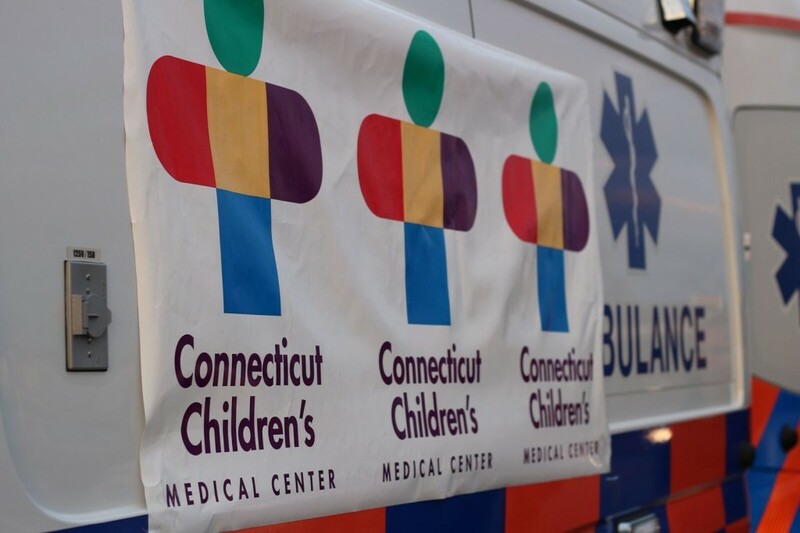 MANCHESTER — A free Continuing Medical Education course will be held Tuesday, July 23rd at the Ambulance Service of Manchester, 275 New State Road from 7:00 pm to 9:00 pm. 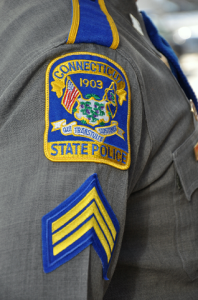 Trooper First Class Bob Maynard of the Connecticut State Police will present a Tactical Medicine Overview as well as the Emergency Services Unit of the CSP’s medical capabilities. 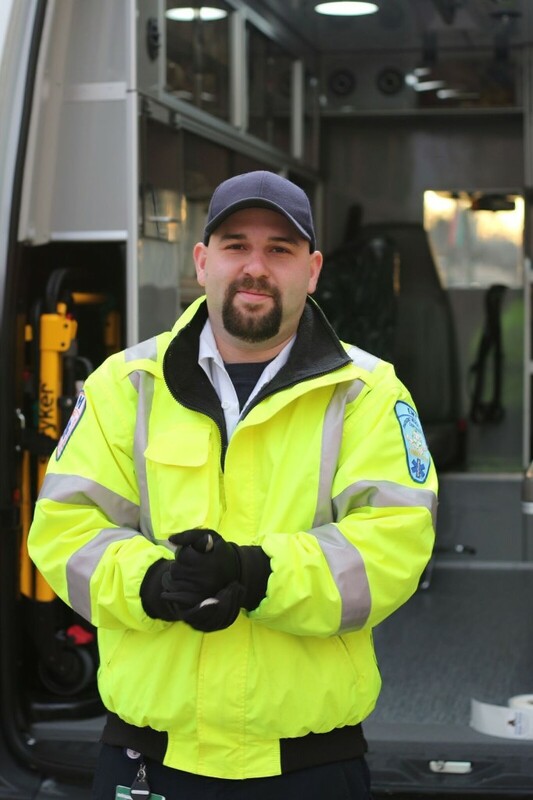 TFC Maynard will also review critical factors in scene awareness. 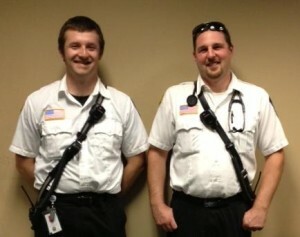 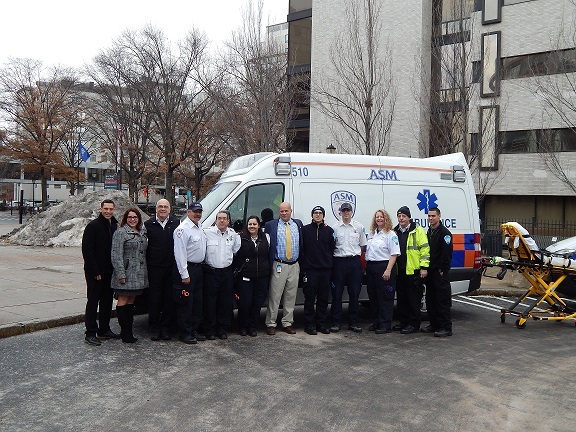 All levels of EMS provider are welcome as are fire fighters and law enforcement. 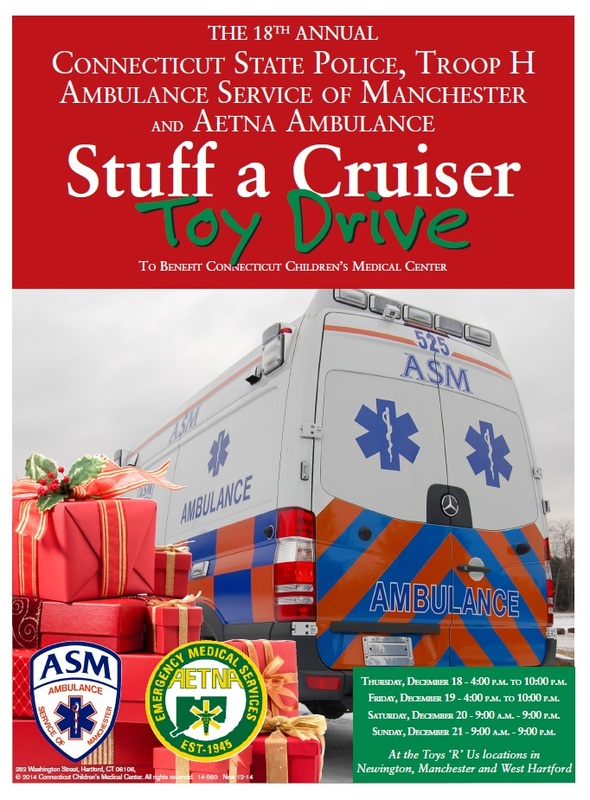 For more information or to register, contact Melissa Osborne at mosborne@asm-aetna.com. 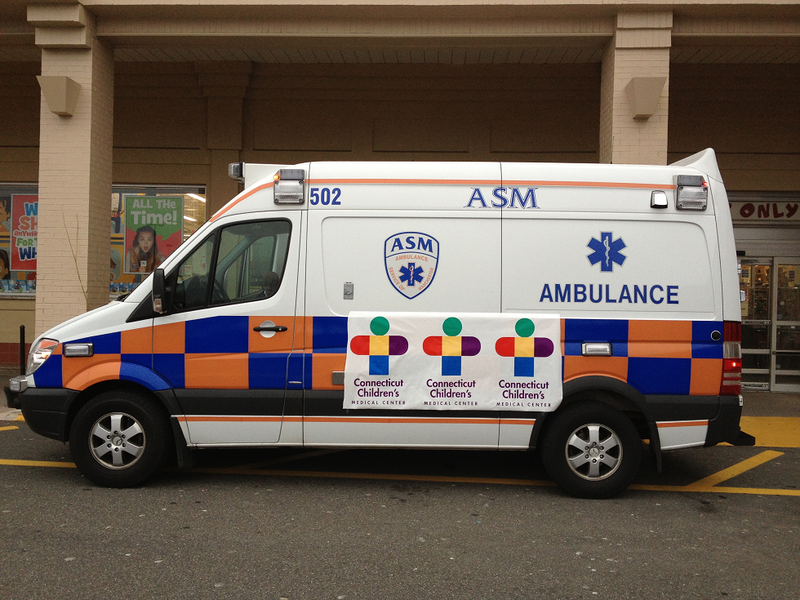 CME hours will be available depending on sponsor hospital. 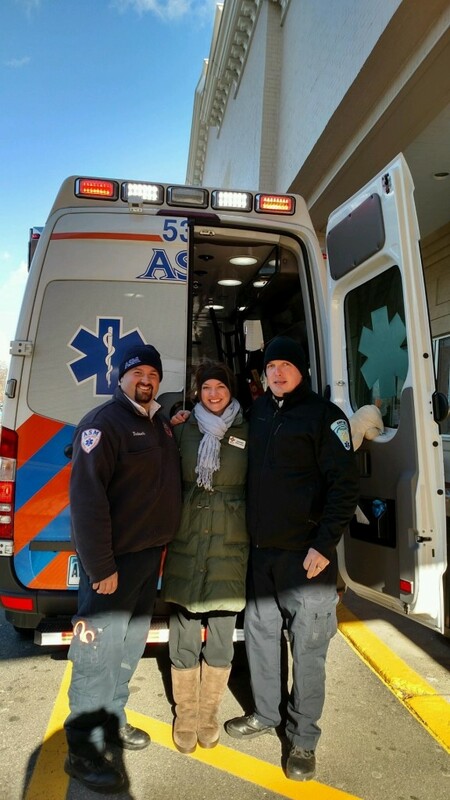 Note: Aetna Ambulance does NOT provide emergency services to the Town of Newington. 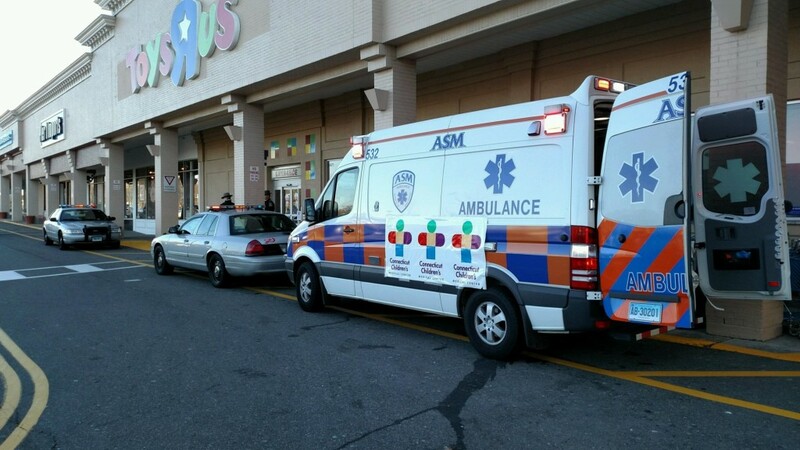 Always dial 9-1-1 in the case of an emergency. 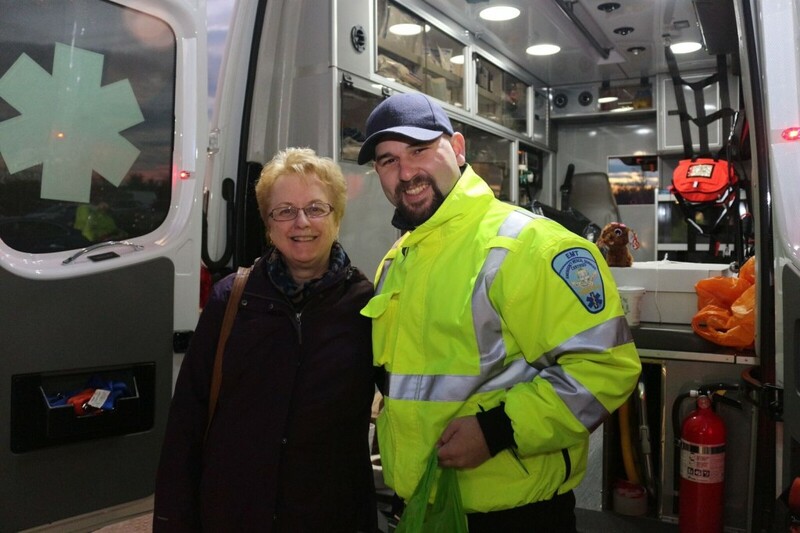 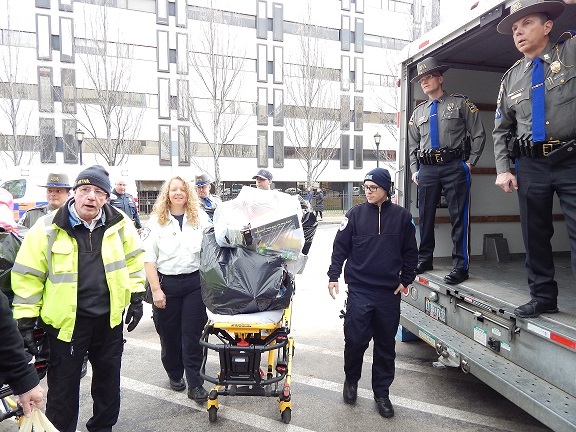 NEWINGTON — Aetna Ambulance and the Ambulance Service of Manchester were part of the team in the 16th Annual Connecticut State Police “Stuff-a-Cruiser” Toy Drive. 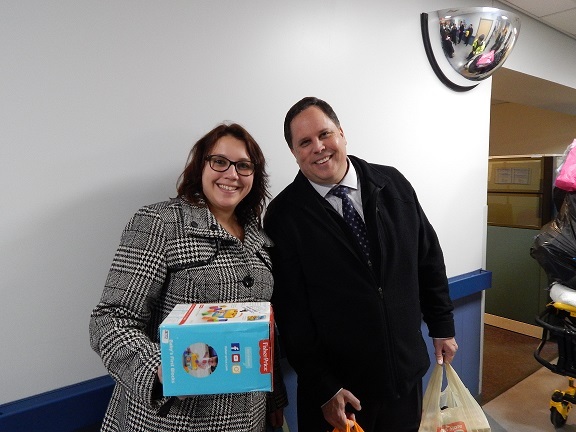 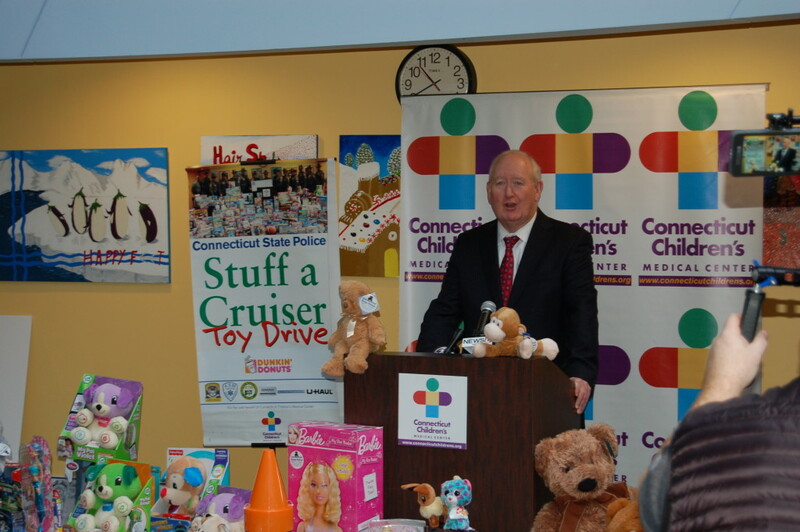 The Toy Drive aims to provide a toy to each child seen at Connecticut Children’s throughout the year. 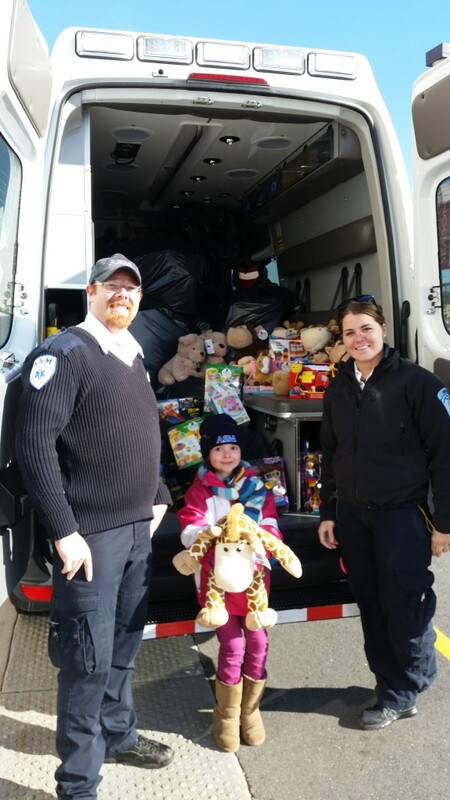 This year’s haul was over $10,000 in cash for Child Life Services and over 50,000 toys. 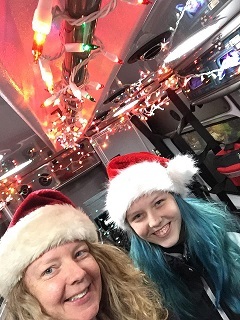 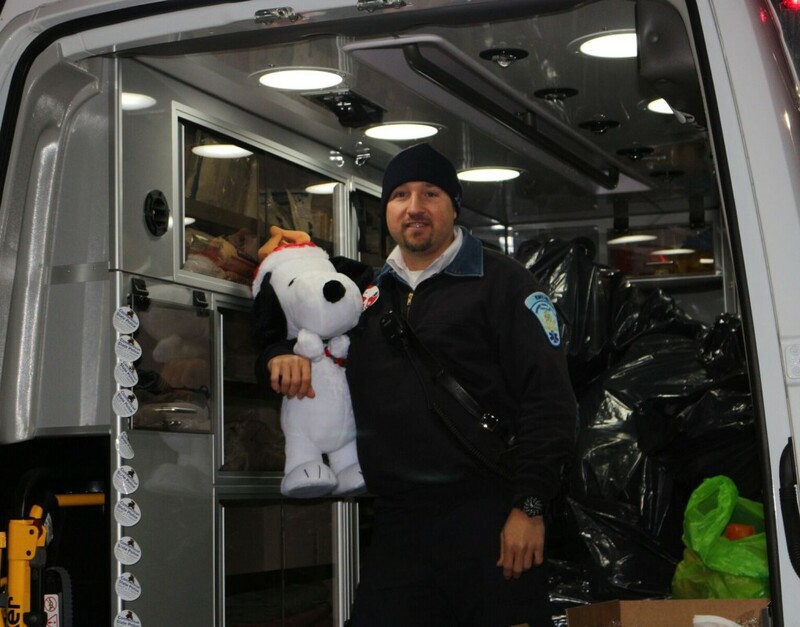 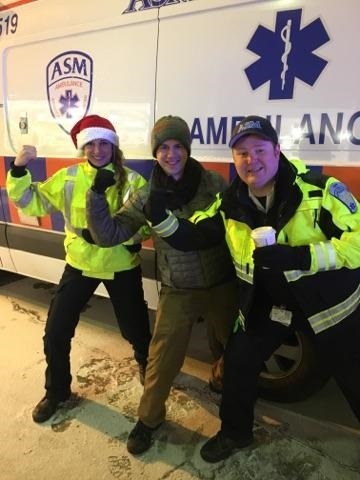 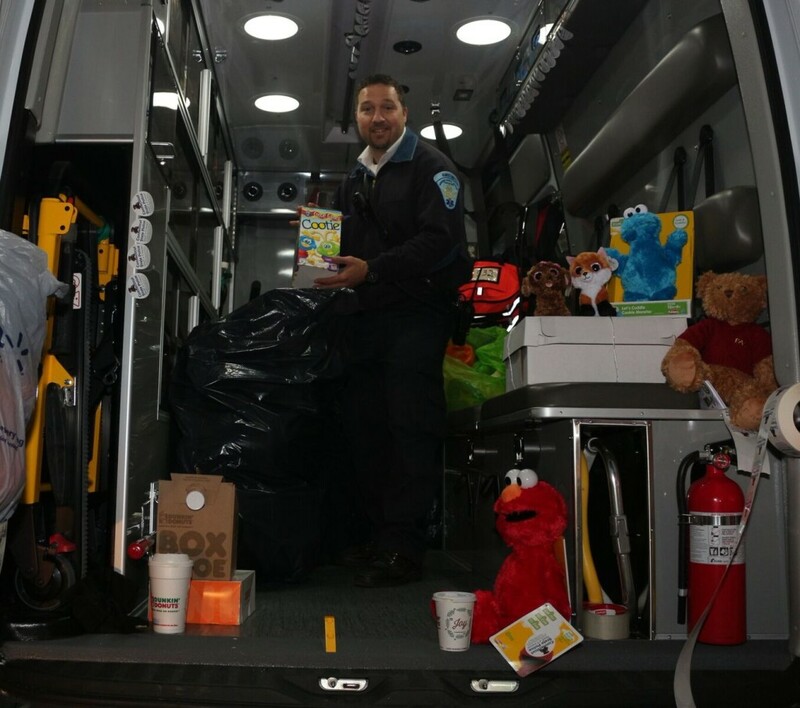 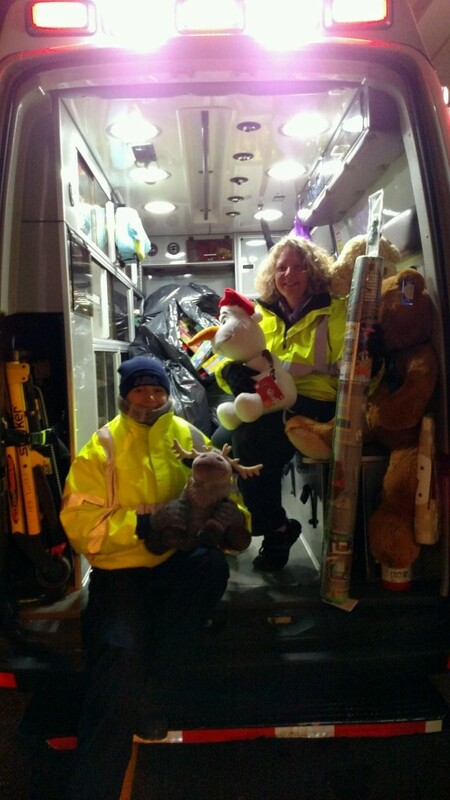 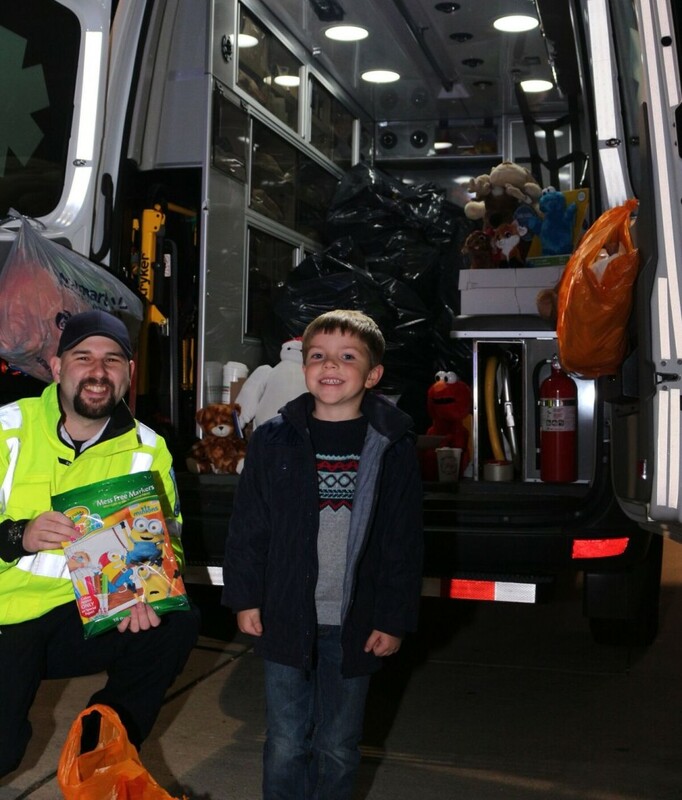 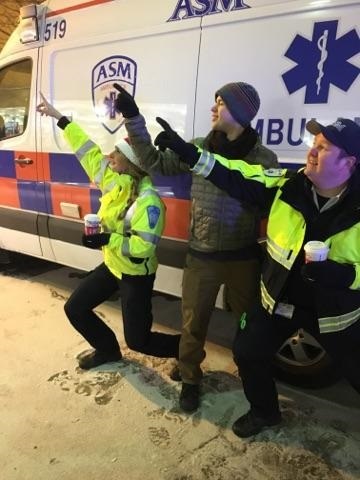 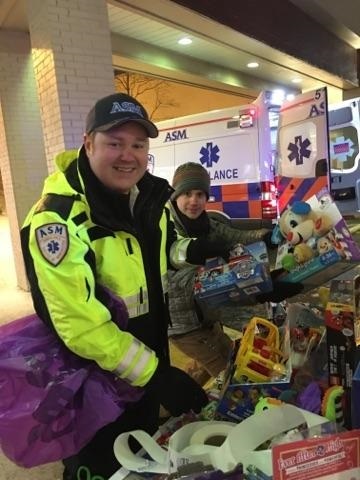 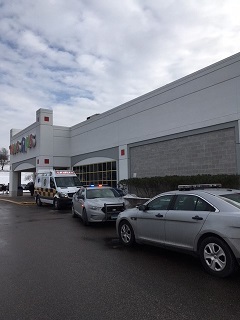 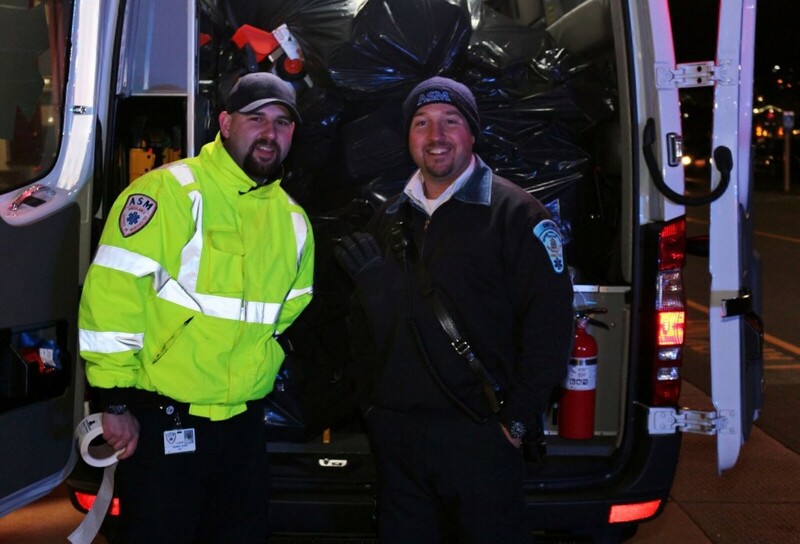 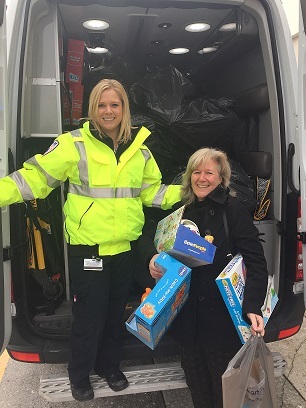 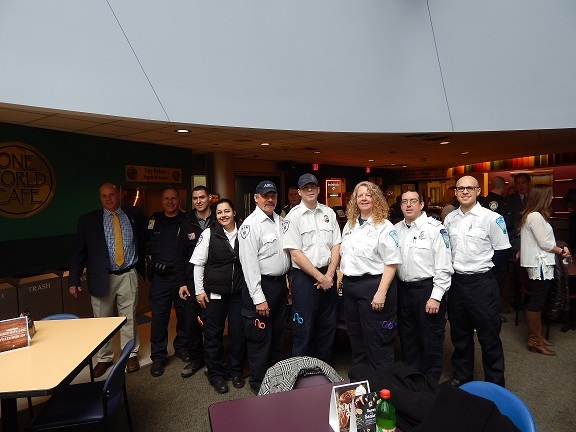 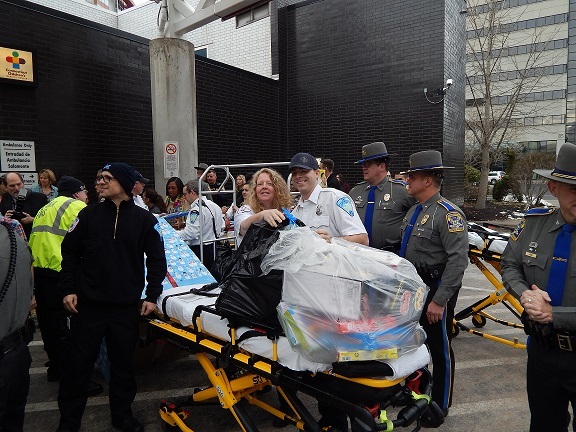 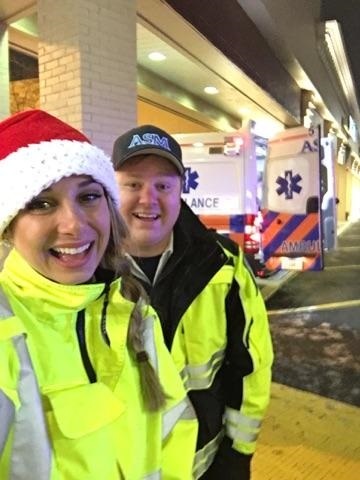 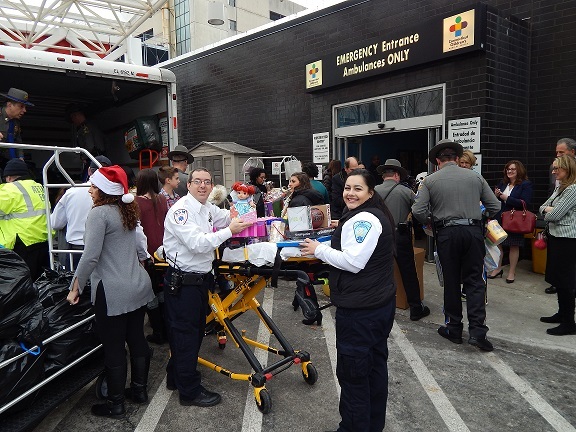 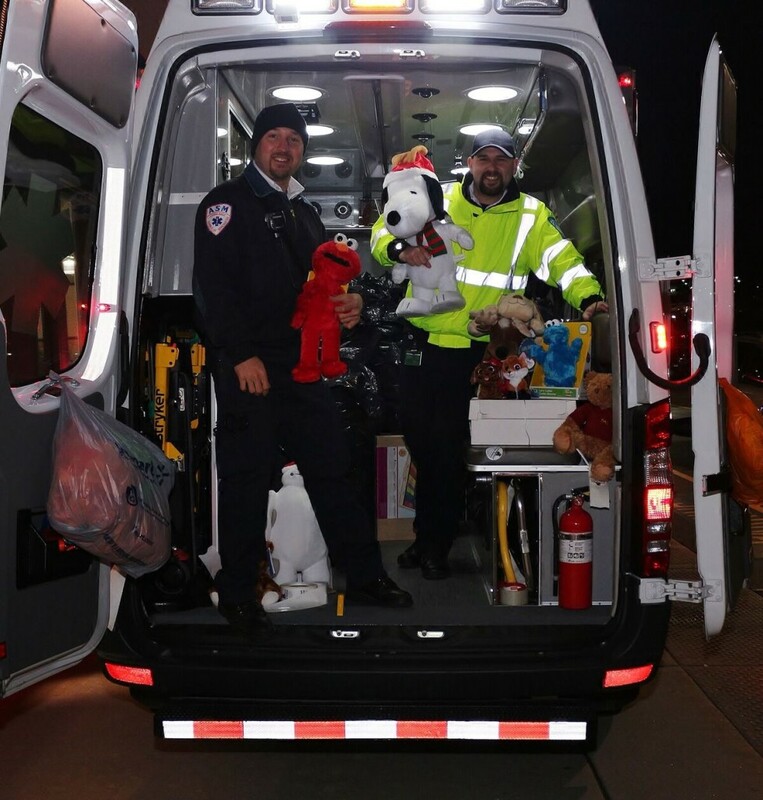 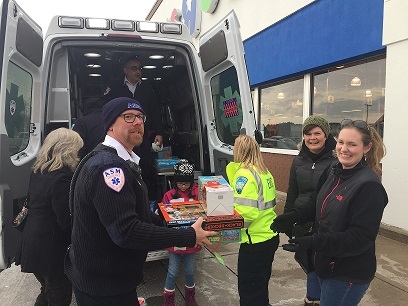 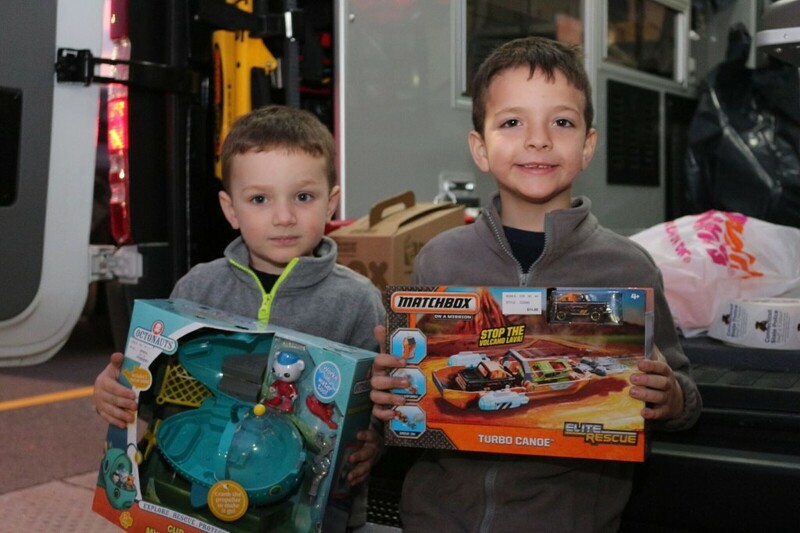 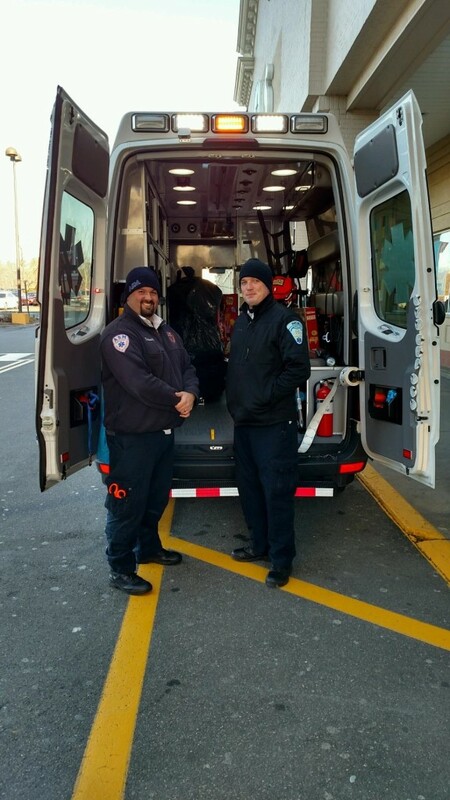 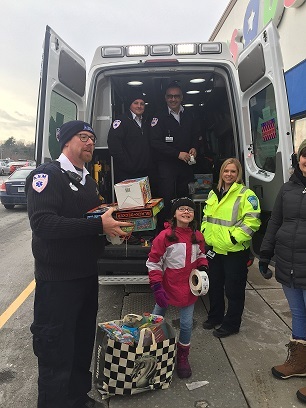 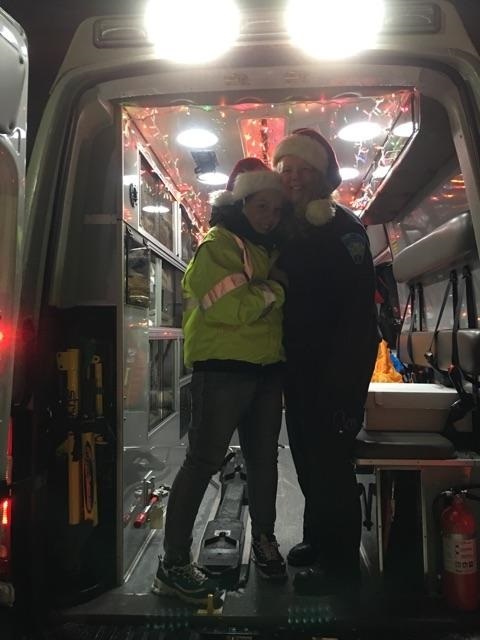 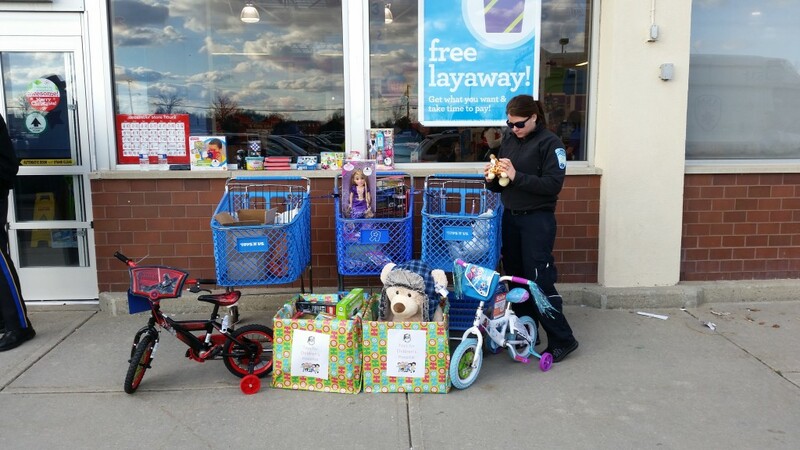 HARTFORD — Aetna Ambulance and the Ambulance Service of Manchester were part of the team in the 16th Annual Connecticut State Police “Stuff-a-Cruiser” Toy Drive. 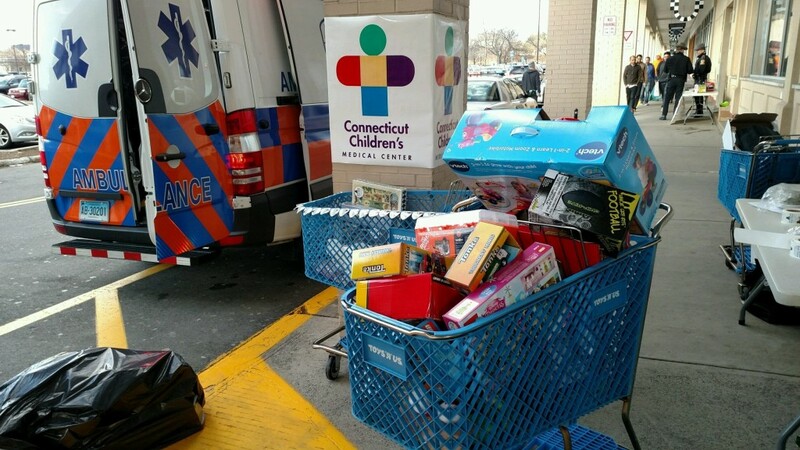 The Toy Drive aims to provide a toy to each child seen at Connecticut Children’s throughout the year. 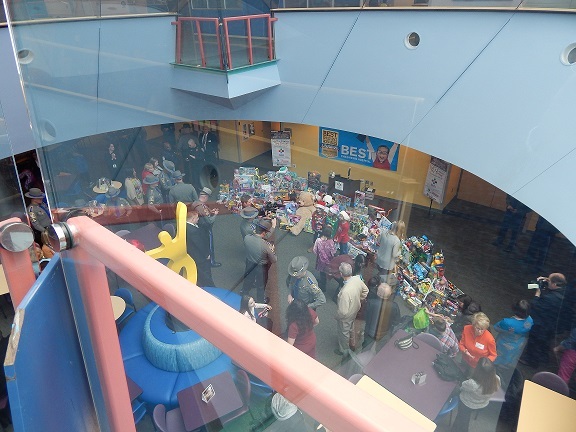 This year’s haul was over $10,000 in cash for Child Life Services and over 50,000 toys. 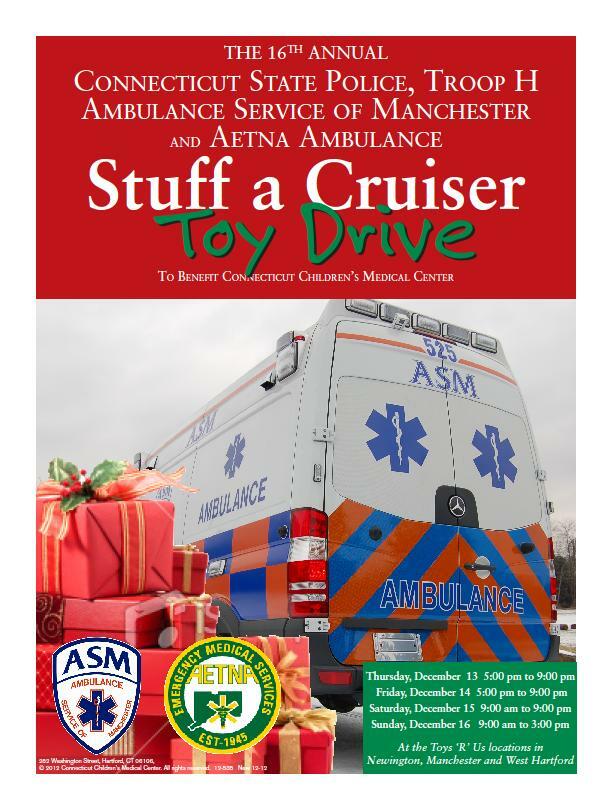 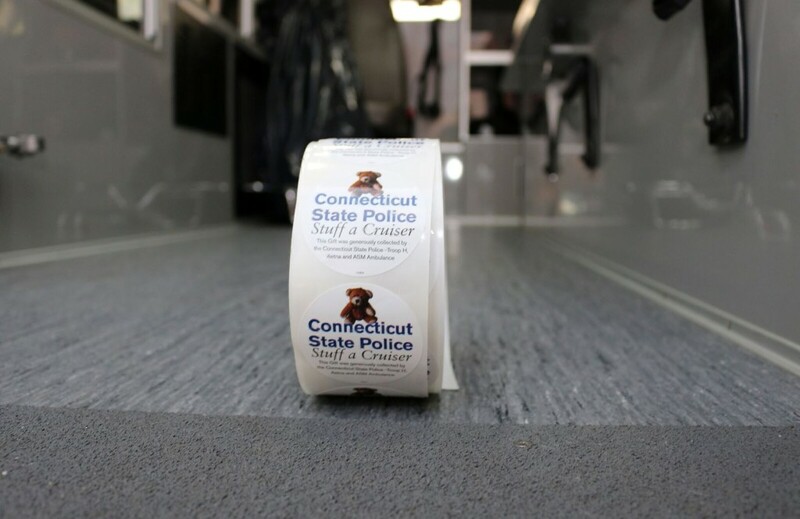 HARTFORD — Aetna Ambulance and the Ambulance Service of Manchester have once again been asked to take part in the annual Connecticut State Police “Stuff-a-Cruiser” Toy Drive to benefit Connecticut Children’s Medical Center. 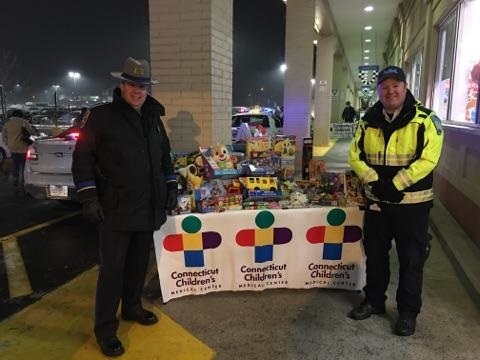 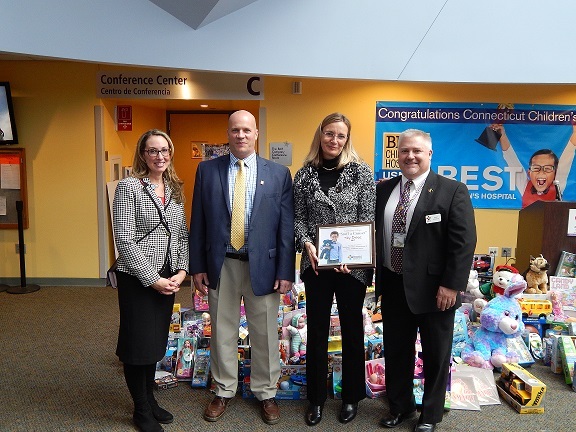 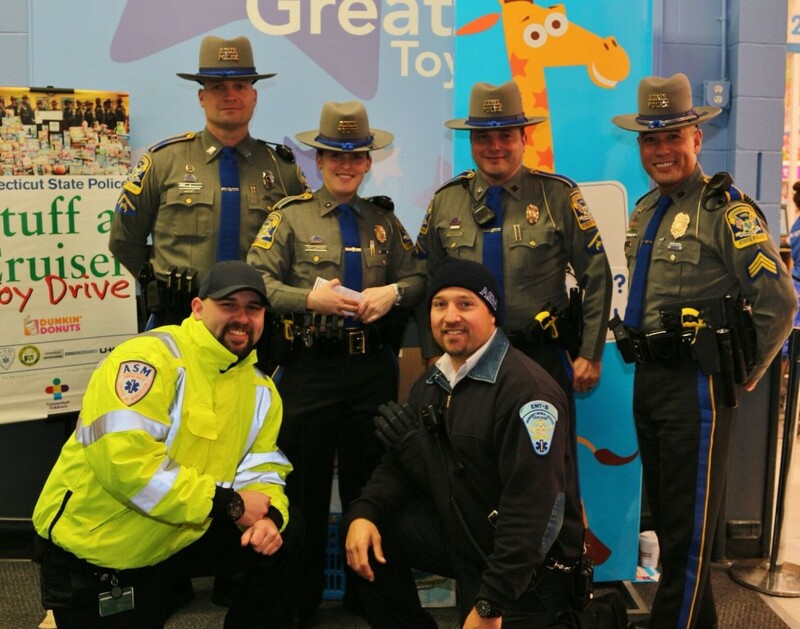 Connecticut State Police, Aetna and ASM hope to collect enough toys in one weekend to give a toy to every child seen at Connecticut Children’s throughout the year. 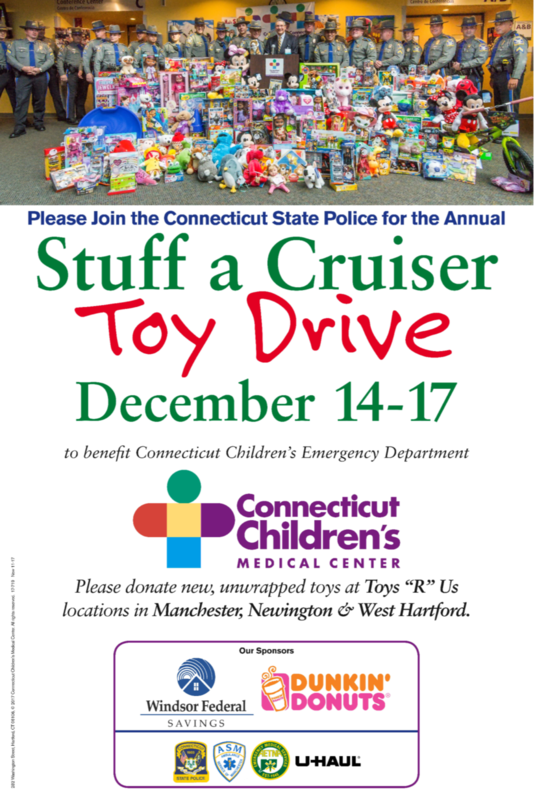 Organizations or individuals that are interested in donating toys to this cause should call (860) 647-9798 x 249 for details or to arrange to have toys picked up at their location.